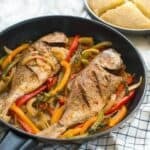 Jamaican steamed fish recipe – lightly seasoned red snapper steamed with an assortment of bell peppers and onions with a side serving of bammy. If you’re a huge fan of seafood, then you will definitely fall in love with this Jamaican steamed fish. I grew up surrounded by so many fish dishes. This fish dish is flavoursome with a hint of Caribbean flare. 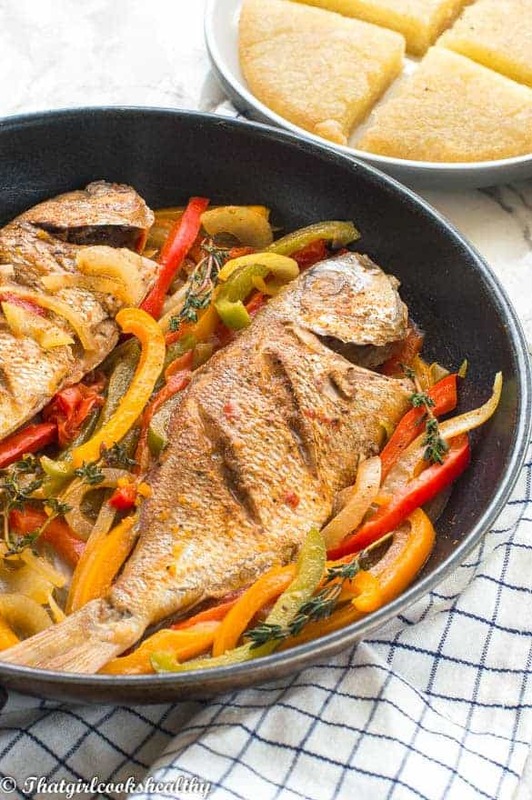 Therefore, it would be wrong of me not to share how to cook Jamaican steam fish. In my household my mother and grandmother used to cook fish every Thursday and during Easter (good Friday). With Easter being just around the corner what better way to end lent then with this tasty fish cuisine. In the Caribbean you will find fish in abundance – doctor fish, parrot fish, mehi mehi (dolphin), jack fish, barracuda etc… you name it and we have it! For that reason you will find SOOO many fish recipes featured throughout the Islands with it’s unique flare. My favourite fish is parrot fish followed by red snapper which this recipe calls for. 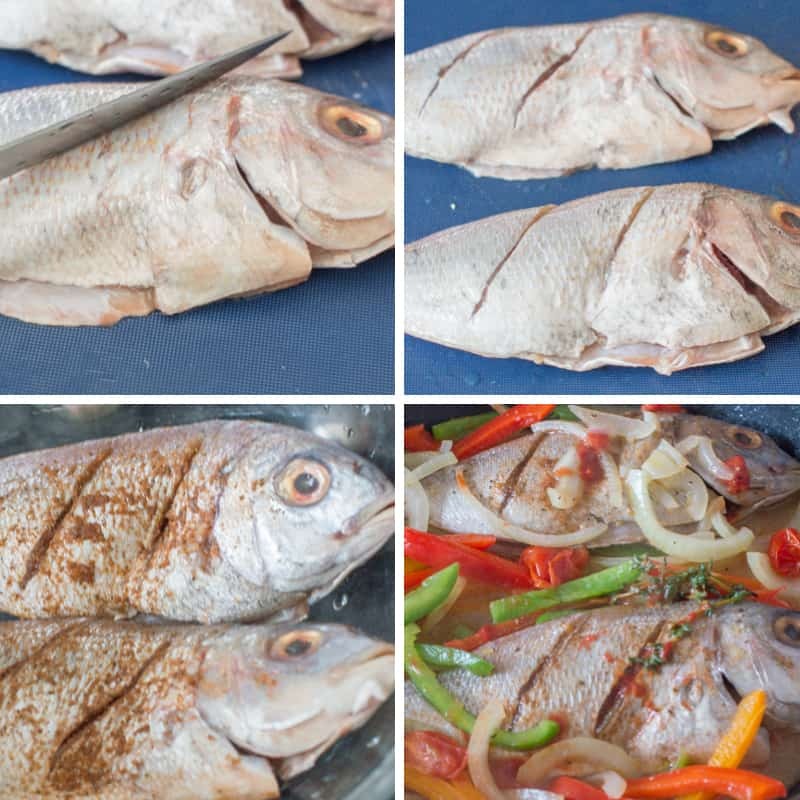 What type of fish is used to make Jamaican steamed fish? The most popular choice tends to be snapper but there’s not reason why you cannot turn this into a parrot fish recipe. You can purchase red snapper from your fish monger. I normally buy mine in bulk because I cook fish on a constant basis. Also, you can ask your local fish monger to gut the fish for you. I prefer them to do this as I really don’t like doing it myself. Despite my grandmother teaching how to clean fish, to this day, I try to avoid it. You will save a bunch of time outsourcing the job and can focus your efforts elsewhere. For instance preparing the fish seasoning which is so simple to make. As previously mentioned, I mill all of my homemade seasoning in my coffee grinder. All of the aforementioned are common pantry ingredients. Do note that you won’t need to use all of the dry rub as the fish only needs to be lightly seasoned. What should I do with any excess seasoning? Store the leftover seasoning in a small, air tight jar or container. If you follow my blog you will most likely re-use it at some point. As long as the seasoning is stored away in a dry place, it will last for several months. Although, Jamaicans embrace Good Friday and abstain from red meat and only eating fish. This recipe can be eaten anytime of the year. 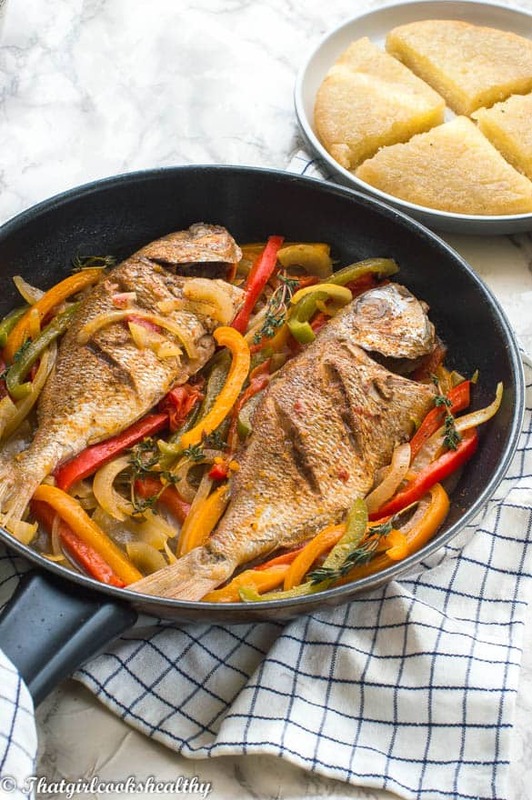 What is Jamaican steamed fish served with? 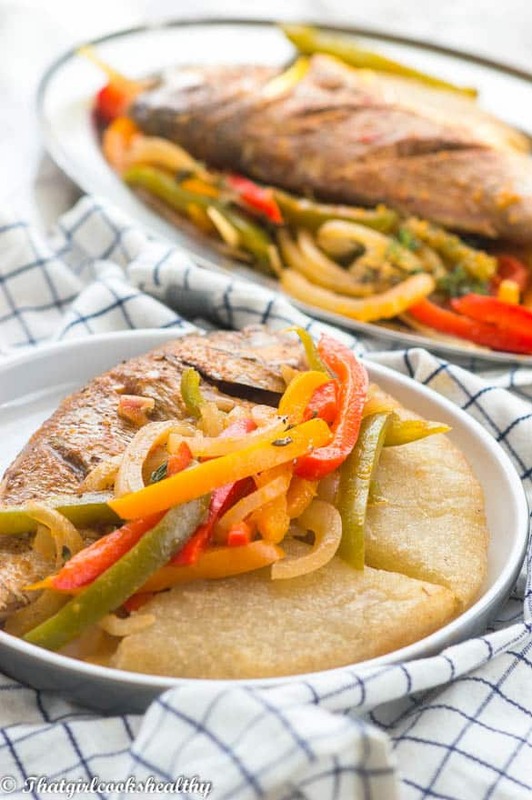 Typically steam fish can be paired with water crackers, rice, ground provisions (root vegetables) or bammy (cassava flat bread). In terms of dietary requirements this recipe is suitable for the gluten free lifestyle and paleo approved. 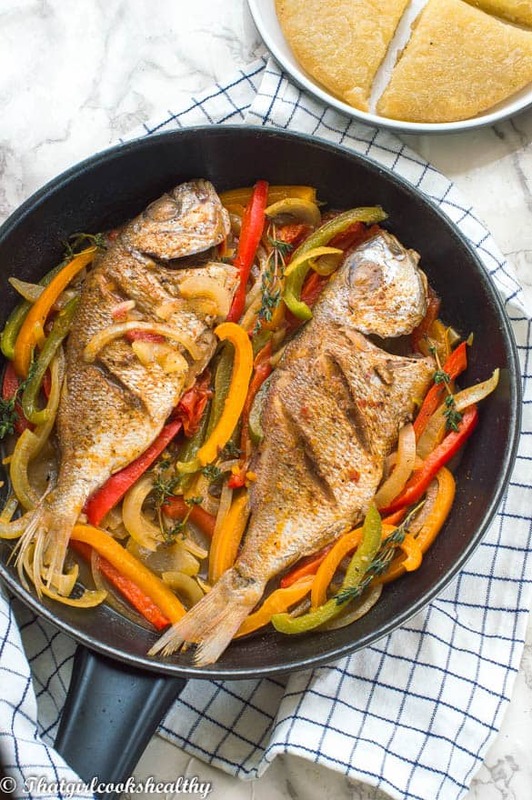 Delicious Jamaican steamed fish – great to finish lent with this seafood dish but can be eaten anytime of the year. Cut the lime in half and then proceed to rub the lime halves over the inside and outside of the fish. Squeeze down so the juice from the lime is expelled onto the flesh. Rinse the fish directly under cold water, open the cavity to ensure the inside is thoroughly clean. Pat the fish dry then place on a plastic chopping board. Use a knife to create two shallow diagonal clashes on each of the fish. Sprinkle a bit of the fish seasoning into each crevice (clash) and the cavity of each fish. Refrigerate the fish and leave to marinade for an hour or overnight. On low-medium heat, melt the butter in a large skillet or frying pan then add all of the vegetables. Stir the vegetables so they are coated in the butter and cook until slightly soft for 3-4 minutes. Season the veggies with pink salt, black pepper then stir. Pour the water into the pan followed by the tomato puree, hot sauce and sprigs of thyme and then stir again. Carefully add the red snapper to the pan, move the vegetables to the side and spoon some of the liquid onto the fish. Repeat this 2-3 times. Bring the pan to the boil then reduce the heat to low. Cover the pan with the lid then steam the fish for 10 minutes in total, turning the fish half way through the given time. What a delicious Jamaican steamed fish! I simply cannot wait to try it! Very interesting combination of ingredients. I am saving this recipe for later. I have never thought to steam fish, but this looks equally easy and tasty!! I’ll have to try it soon! Beautiful presentation with the whole fish and colourful peppers! This looks really tasty and healthy too! I’m such a fan of ALL the seafood. If I could eat fish everyday I honestly would. This recipe sounds and looks absolutely amazing. I love the seasoning and all the veggies. I’m saving this recipe and making this for my family. Thank you so much Natalie. I hope yourself and the family enjoy it too. What gorgeous colours! I love you added all those different coloured peppers. Nice! Thank you Jacqueline. I don’t think it would Caribbean if I didn’t add some tri colours of bell peppers. I may have asked this before, if I did, my apologies. Hi AnnMarie, I’m in the process of writing the manuscript for my cookbook which I’m hoping to release this year. Hi Shinel. Yes of course! I will put your request on my to-do-list for next month and will make a point of doing a tutorial guide on cleaning fish. Hi! Can I substitute snapper with porgies? Hi Jennifer. Yes porgies or any whole fish would work well with this recipe. 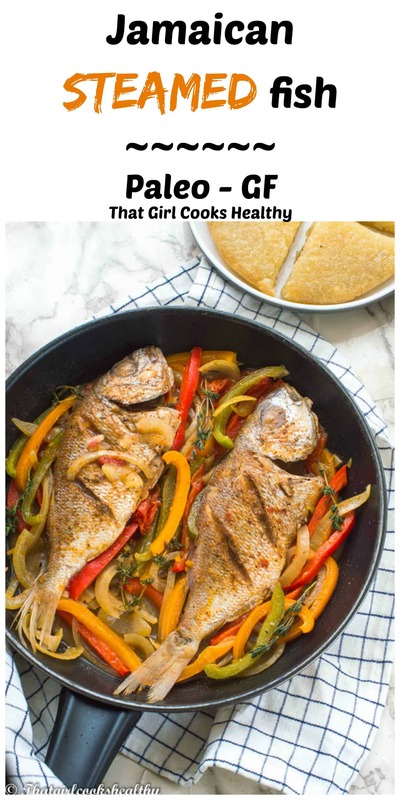 I love Jamaican cuisine, and steamed red snapper is a favorite of mine personally. I’m making this version of the recipe today… Thanks to you!!! GOD Speed!!! I’ve made your recipe three times and don’t feel the need to change a single thing. Thank you for sharing – it is DELICIOUS. Thank you !! Thank you so much your feedback Paula.